The upward bow caused by string tension only becomes a real problem when it is excessive and unadjustable. The truss rod's main job is to keep the strings from pulling the neck into a exaggerated bow shape. A problem occurs when the bowing can not be controlled or adjusted by the truss rod. This happens when either the neck has no adjustable truss rod, the rod is broken or it has merely lost the battle with tension and is helpless to straighten the neck. When appropriate, some necks can be planed and re-fretted with a fret wire which has wider fret tangs to encourage straightening and stiffening of the neck. Unlike excessive relief (an upward bow of the neck) a twist occurs in such a way as to render the neck lower on one side than it is the other. Very minor twisting may not create noticeable playing issues but more substantial deformities can cause fret out and buzzing. Although twisted necks need to be evaluated to determine the best remedy, planeing is sometimes a remedy. 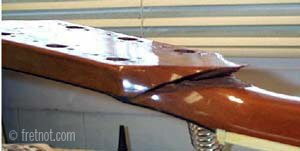 Because wood is removed, the severity of the twist, fingerboard and neck thickness must be taken into consideration. It should also be mentioned that a new instrument exhibiting neck twist may continue to do so in the future, making the repair temporary. Planeing an older neck, which has likely taken a set and stopped twisting is more favorable. Breaks frequently occur where the peghead meets the neck. Without a doubt, the most vulnerable area of the neck is the point at which the peghead and neck merge. The angle of the peghead creates what is called "grain run out". This makes the area behind the nut more vulnerable than other areas. In an attempt to reduce it's vulnerability some necks are made from more than one piece of wood. 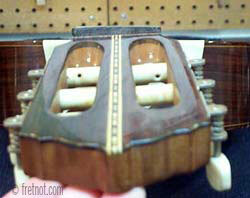 Joining the peghead to the neck with a scarf or fingerjoint enables the peghead to be cut from quarter sawn wood. Regardless of the methods used to build guitar neck's breaks occur. A set neck (ex. Les Paul/SG) can come loose where it attaches to the body by impact, heat or failed glue joint. A loose neck can create high action and often leaves a visible gap between the heel and neck. You should remove string tension if you discover the neck is loose from the body to prevent severe damage. Most simple peghead crack repairs start at $100. Unless replacement is not an option (unavailable, vintage), bolt on necks are normally replaced due to their reasonable replacement cost. Set necks, those glued to the body, are costly to replace when repair is not possible. 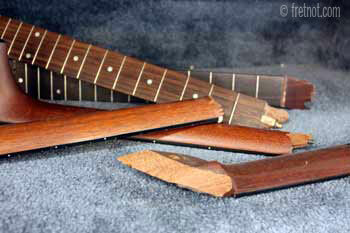 The cost of a factory replacement neck often rivals or exceeds the price of less valuable guitars. Generally speaking, instruments that can be purchased for under $1,000 rarely warrant replacing a glued on, set neck.